What does the fall in the price of oil do for global economic growth? If the price of oil had swiftly risen by 50%, economic commentators would be calling this an economic disaster. In fact the price has fallen by 50% since June last year, yet this ray of good news hasn't pierced through the gloom of economic commentary, even though it represents an annual transfer of around 2% of world output from oil producers to consumers. Part of the explanation is that economists, like many commentators, find a gloomy story much more interesting than a happy one. As well, every silver lining is part of a dark cloud. There are winners and losers, and any sharp change in prices requires adaptation, which often causes problems. Moreover, the fact that no one saw this coming is a reminder of the uncertainty of oil-price setting (see graph above), which encourages forecasters to hedge their bets and investors to be cautious. Let's try to set out the pluses and minuses. On the minus side, it might just be temporary. The lower price will be unprofitable for some suppliers, who might halt production. But the Saudis tried this in the 1980s and it was largely unsuccessful. What's more, limiting production now would just transfer revenue to rival suppliers who would use their stronger oil revenue to oppose Saudi interests in the Middle East. Some commentators argue that the fall in oil price is just a reflection of how badly the global economy is doing; that it reflects an adverse demand shock (bad news) rather than beneficial extra supply (good news). Europe is certainly pathetically weak, but the main story is on the supply side. There clearly has been a substantial supply increase (much of it in the US, where technology has unlocked 'tight oil'). This extra supply has been putting downward pressure on prices for some time, with the sharp break coming after Saudi Arabia said it would not cut production to support the price. 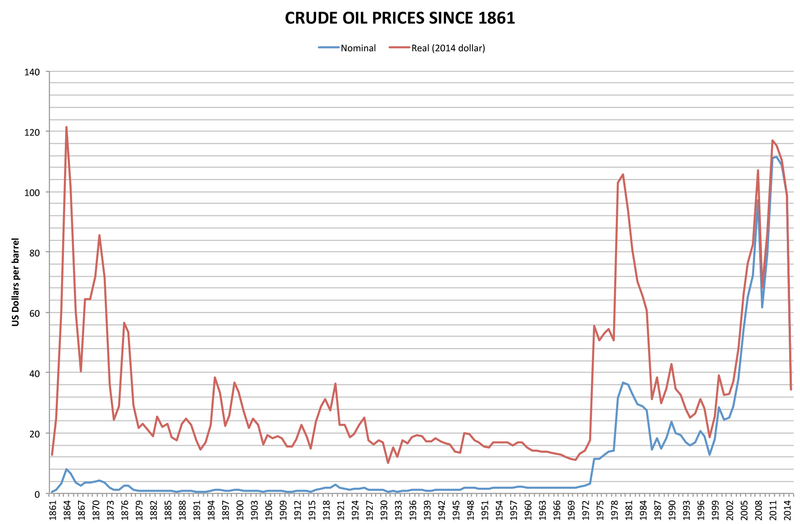 In short, a reasonable guess suggests the oil price might rise a bit from the current level, but not much. The International Energy Agency's predictions of demand (93-95 million barrels per day) intersect an estimate of supply (see chart below) at around current prices (although note the sharp upward kick in the tail of supply, as more expensive sources are brought into production). Of course the fall in price is bad news for net oil exporters, so does this balance out the benefit to the net importers? Some governments in oil-exporting countries, particularly in Africa, will have to dramatically cut spending because of lower revenues, but they don't bulk large in global terms. Others, such as Russia, Iran and Venezuela (especially badly affected) aren't our close mates anyway, so we don't care much about their loss of income. It might even cause them to curb some of the behaviour we find offensive. But if the impact was so bad that one of them (say, Russia, where oil exports are 13.5% of GDP and provide half of budget revenue) had a total economic collapse, the spill-over would damage global growth. Still on the negative side of the argument, a lower price will discourage investment in energy production everywhere, which will trim overall economic demand. And for those worried about the environment and climate change, the lower price will encourage us to use more energy and lessen the incentive for energy-saving innovation ('tumbling oil prices have long been seen as kryptonite for clean energy companies'). Australia is a net importer of petroleum, but this benefit will be offset to some extent by the damage done to the price of our exports of coal, a close substitute. So much for the offsetting factors and things that could go wrong. What about the benefits of a lower oil price? In a world of deficient demand, shifting a large amount of income from wealthy, high-saving oil-producers in the Middle East to the rest of us has to boost world demand, lower inflation and help the external account. In those emerging economies where petroleum consumption is subsidised (Indonesia, India and many others), this will help the budget. For the rest of us, it provides an opportunity to raise taxes on petrol, with beneficial effects on both the budget and the environment. The IMF remains gloomy about global growth (despite its own figures showing essentially no slowing so far and none in the forecast). In its most recent World Economic Outlook (in October), the Fund was still identifying the main risk as an oil price increase with a $25/ barrel hike estimated to cut at least 0.5% off global growth. Now that the Fund is looking at a price shock twice as large and in the opposite direction, its tentative answer is that this will add between 0.3% and 0.7% to world growth. When the Fund incorporates this into its updated global forecast later this month, we'll see if this breaks the unrelieved gloom that has permeated discussion of global economic prospects since 2008. This is unambiguously good news for global economic growth (the similar oil-price fall in the 1980s ushered in a period of outstanding growth). Moreover, it presents opportunities to gather the windfall through a carbon tax and use the revenue to boost infrastructure and fix budget problems. But the reception to the good news has so far been so low-key that it looks like this policy-making opportunity will slip by almost unnoticed. So much for the economics. Political scientists might recall that, while the fall in oil price in the 1980s didn't single-handedly bring about the collapse of the 'Evil Empire', it certainly made the Soviet economy susceptible to the disruptive political forces then operating. A number of oil producers in Africa and Latin America will now have to dramatically tighten their belts – never popular. There is potential for dramatic change. Graph courtesy of Wikipedia Commons and IMF Direct.